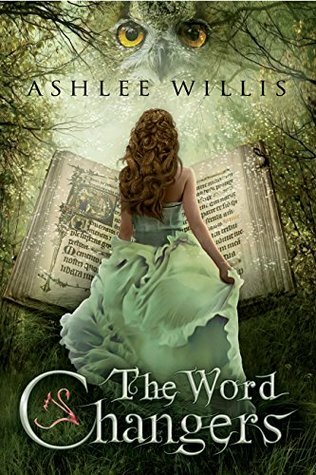 Today I would like to share with you a new favorite book: The Word Changers by Ashlee Willis. When Posy wakes up in a strange place where everyone seems to believe she is a princess, she knows something must be wrong. The last thing she can remember is running out of her house and hiding in the library with a book to get away from the angry words being exchanged by her parents. Before long, she realizes that she has somehow been transported inside the book. The characters have brought her here to take the place of the princess of the story, who has inexplicably gone missing. But there is far more to this story than a runaway princess, and Posy is about to find out just how close to the edge of violent conflict this story actually is. The Word Changers is an extremely sweet and enjoyable piece of meta-fiction. Meta fiction can take many forms, but generally it is a writing device in which the author constantly draws the reader’s attention to the fact that they are reading a book. In this genre, we often see characters who are aware that they are characters, they may interact with the reader, and will often refer to their “author” in some way. It’s a fun way to write a story, and the cleverness of it appeals to me. In The Word Changers, you will meet a variety of interesting characters. Posy as the heroine is an extremely believable 15-year old girl. She goes back and forth between enjoying the “princess” treatment and being terrified that she has been in the story too long and worried that she will never get home. She is brave when she must be and frightened when most people would be, and her internal struggles are very real. Most of the story is told from her perspective, making her the most well-developed character in the story. Then there is Kyran, who I fell in love with right along with Posy, despite the rocky beginning to their friendship. The fact that he struggles with anger and an inability to forgive the people who have hurt him just serves to make him a more real character. The story is filled with adventure, and the author does a good job bringing the characters to the brink of danger so that you will worry that the story cannot possibly end well. There were a few things that I found a bit distracting. First, the author name and title of the book are down at the bottom of the pages instead of at the top where you usually find them, and this was very difficult to ignore until I got a good way into the book. Second, the author went back and forth on the spelling of “advisors” and “advisers” throughout the book. Third, there are a few places where I felt that the story went a bit slowly. Finally, as the story drew to a close, I found myself desperately wanting to discover the conclusion to Posy’s real life situation, but the author closes the book before we get to see it… all we see is Posy’s determination to face the situation differently. However, despite these very minor criticisms, I enjoyed the story quite a lot. I liked the way Posy’s actual history unfolds within the story. At home, she is dealing with a very real, very negative situation, and the story she is in helps her figure out a new way to deal with that situation – as books are wont to do. Her “escape” into the book is reminiscent of anyone’s desire to lose themselves in a story, to get away from their own problems inside the fictional problems of fictional characters. Overall, I would definitely recommend this book, and I look forward to reading more by this author. I give it four dragon eggs. This book sounds very interesting. I like the idea of meta-fiction, though I have not read much of it. I may have to check this book out at some point. Nice to see the eggs again, it’s been a while, I think since you’ve done a proper review. Thanks for sharing this one! Meta-fiction is great. Jasper Fforde is very good at it. I’ve read a few others besides his, but he was the author that got me interested in it. Love being able to use my dragon eggs! Trying to do some more “proper” reviews so I can use them more often! Great review! I enjoyed reading it. I love meta-fiction. This sounds like a great book; I might just need to pick it up. I LOOOOVE THE WORD CHANGERS. <3 It is one of my faves. ^_^ I need to own a beautiful physical copy!! And yes, Kyran I love. I love the new cover! I liked the original, but after reading it the new cover fits way better. Sounds like a clever and fun premise. I have to say first up that I just love that book cover! This books sounds pretty cool, I realise it’s difficult to say (cause it often depends on the maturity and reading level of the child) but what ages would you say this would suit? I am often looking for books for my tween and teen and so was wondering if this would suit. Many thanks. Hmm, I would recommend it for ages 15 and up. Posy, the main 15-year old protagonist, has a few somewhat more “grown-up” feelings of attraction to Kyran. I tend to be a bit overcautious when it comes to romantic themes, though. Nothing was ever inappropriate, but as I was reading the book I didn’t know if anything was going to cross that line, and there were a few lines/phrases/word-choices that made me nervous. It probably wouldn’t bother me on the second read-through, knowing where the story goes. There’s also some violence, especially at the end. Nothing graphic, but it does end in a big battle. If you were reading out loud to your kids, I think it’d be fine for ages as young as 11. To read alone, definitely depends on the child, but I’m gonna err on the side of caution and recommend 15 and up.